An overview of vendor check-in time sessions is listed below, but the check-in time we have specified for you on the list HERE is the correct one. Anything listed below "MAY" differ, so please go by check in time we have assigned to you on THIS LIST. YOUR CHECK-IN TIME: The alloted time frames are for vendors to check in, receive the vendor packet and unload merchandise as quickly as possible into spaces. PLEASE NOTE: NOT ALL VENDORS WILL DRIVE IN BARN TO UNLOAD. 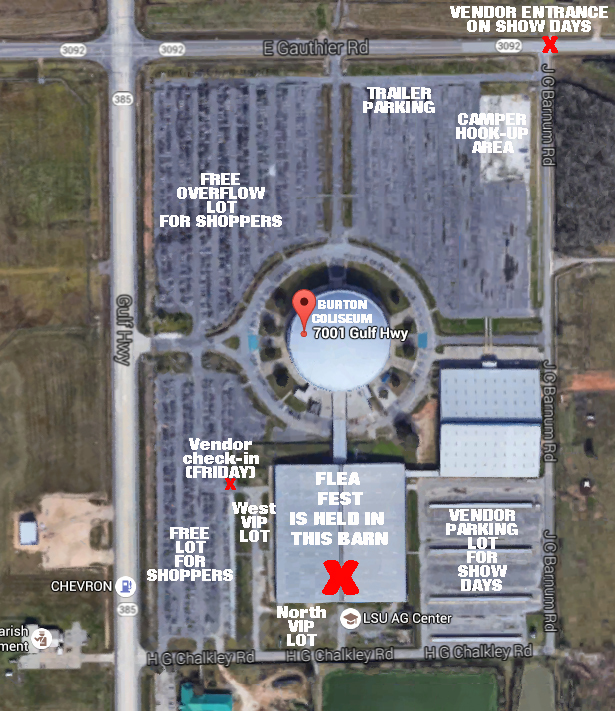 Flea Team members will direct each vendor to their designated unpacking area. After merchandise is unloaded into the vendor space, vehicles should immediately be moved from inside the barn (or from the assigned unpacking area)and be parked in the outer parking lot away from the barn to allow others to also get up close to unload. After vehicles are re-parked, vendors may return to the booth space to continue to organize and arrange. Vendors have from the start time of allotted check-in window until 6pm to finish setting up/arranging merchandise in spaces. NO TRAILERS or VENDOR VEHICLES OF ANY TYPE are to be left in the within the fenced in area surrounding the event barn after 6pm. Violators may be towed at owners expense. See this map to understand all parking locations and entrances. We encourage all local vendors to take trailers home, but If trailers absolutely must be left on site, they MUST now be parked in Burton Coliseum parking lot on the North-East corner near Gauthier Rd. Please note, there is NO SECURITY PROVIDED FOR ANY TRAILERS LEFT IN THE BURTON COLISEUM PARKING LOT, so do so at your own risk. Read the complete information on trailer policy here. *All sessions are subject to change. If changes occur, notifications will be sent via email prior to the show. Again, the List that we have posted here supercedes the times listed below, (should they differ). Final moments to set up spaces. All vendors must begin wrapping up. ***Barn closes at 6pm to ALL Vendors. Vendors must vacate the barn at this time. Set up may continue beginning at 7am on Saturday morning. (Show starts at 8am) Vendors will also be allowed in at 8am on Sunday morning. (Show starts at 9am) Prior to show opening hours, vendors will only be admitted entry at either of the 2 BACK vendor gates. DO NOT go to either of the "Shopper Entrance Gates". NO VENDOR ENTRY WILL BE PERMITTED AT THOSE GATES PRIOR TO SHOW HOURS. Thank you!